Have you ever been irritated by a website? Did you know that readers may be having that exact same experience when they visit your website? Ticking off your website visitors is a bad way to get more readers. 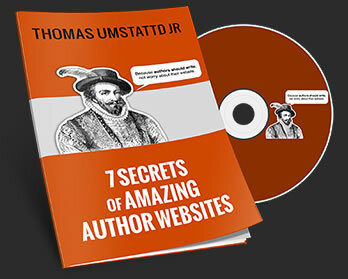 Here are seven ways author websites annoy visitors and what to do about it. The primary reason readers visit author websites is to buy a book. Most author websites make readers hunt from page to page, looking for a way to buy the book. Buying your book should not require the hero’s journey. Include links to multiple bookstores. Not everyone likes Amazon. The free plugin MyBookTable makes it easy to add buttons for multiple online stores. Give your most recent book prominent placement on your homepage. If you have a sidebar, make sure it contains a large version of your book cover. David Z Nowell. You can’t miss his book. Irritation #2: They can’t find the status of your work in progress. Every author has a project or two they are working on. Readers are very curious about these future projects, and often leave author websites frustrated that they can’t find any information about them. Readers want more than just the title and cover. Write blog posts from time to time, updating your readers on the progress of your book. Use a plugin like MyBookProgress to quickly add a progress bar to your website. Here is a 1-minute video that explains how MyBookProgress works. Irritation #3: They can’t easily contact you. Another reason readers visit author websites is to contact the author. I get a lot of hate mail, so I understand the incentive to hide. But a savvy author is easy to contact and hard to interrupt. What happens when the host of a producer of a major TV or radio show needs to contact you to see if you can fill in for an opening that just appeared in their schedule? If a reporter from the New York Times wants to get a quote from you on a story she is working on, can she call you? Mailing Address: Get a P.O. Box and list it on your website’s contact page. This way you can receive gifts and letters without giving out your home address. Contact Form: Place a contact form on your website’s contact page. I recommend the amazing paid plugin Gravity Forms or the free plugin Contact Form 7, which is harder to setup. Social Media: Place links to your social media profiles on your website’s contact page or in the banner/footer/sidebar. Phone Number: Get a Google Voice number and list it on your website’s contact page. This way you can have a phone number and voicemail box without giving people access to your cell or home phone number. I am often shocked how many authors don’t rank for their own book titles on Google. Assume your readers don’t quite remember how to spell your name or what your URL is. Most of them will look for your website on Google and the harder your website is to find, the most irritated they will be. What happens when you type the title of your book into Google? If your book does not rank #1, you are irritating your readers. Create a book page for each of your books. This is critical. If there is no one page focused on a particular book, Google has nowhere to send people who search for that book. Run WooRank and WebsiteGrader reports to generate a list of Search Engine Optimization issues on your website. Install the free plugin Yoast SEO to help improve your SEO. Learn about author SEO basics. A little knowledge goes a long way. If you have been writing for a while, there is a chance you have quite a few books in your back list. Chances are, these back list books are not selling well and your website may be partly to blame. Create a “books” page on your website that lists your books and links to the book page for each individual book. This will help with your SEO (see Irritation #4) and help people browse your backlist. Use a free plugin like MyBookTable to generate a “books” page and the individual book pages for you. This is a pet peeve of mine. I listen to a lot of science fiction and fantasy books on Audiobook. It frustrates me when I can’t find a high-resolution map of the story world. The only way to get the map is to buy a paper copy of the book. Often, even in a paper book, the map is painfully small. Big stories deserve big maps and the best way to deliver big maps is on the Internet. For a map to really work, I need to be able to pinch and zoom on my iPhone while I am listening to your book on Audible. Place a thumbnail of your map on the book page for your book. This thumbnail should link to a high resolution version of your map. For bonus points, also include additional maps for cities or other points of interest. What irritates you most about author websites? Sound off in the comments below. What irritates you about author websites? Post an example of an author “doing it right.